Could the $4 e.l.f. Molten Liquid Eyeshadows be a Dupe for the Milk Makeup Eye Pigments? I recently pulled out my e.l.f. Aqua Beauty Molten Liquid Eyeshadow in Rose Gold after not using it for a while, and as I was applying it, I thought that it looked quite similar to the Milk Makeup Eye Pigment in After Party once it was on my eyes. So of course, that got me wondering if it could possibly be a dupe! The Milk Makeup Eye Pigments are a more recent purchase (I got them earlier this Spring) and I've been obsessed with them for quick everyday looks. Just one little drop covers my entire eyelid and they last until you take them off. Plus the metallic finish brightens up my eye area without looking glittery or childish. But before discovering the Milk Eye Pigments, the e.l.f. Molten Liquids were a favorite of mine so I was really curious to see how they stack up against each other. When I swatched them all side-by-side, you can see that they have a very similar effect (I brushed on two thin layers of the e.l.f. shadows, and one drop of the Milk pigments). Shade-wise, e.l.f. 's Brushed Copper is in-between Milk's Hotel Lobby and Gig. The Rose Gold shade from e.l.f. 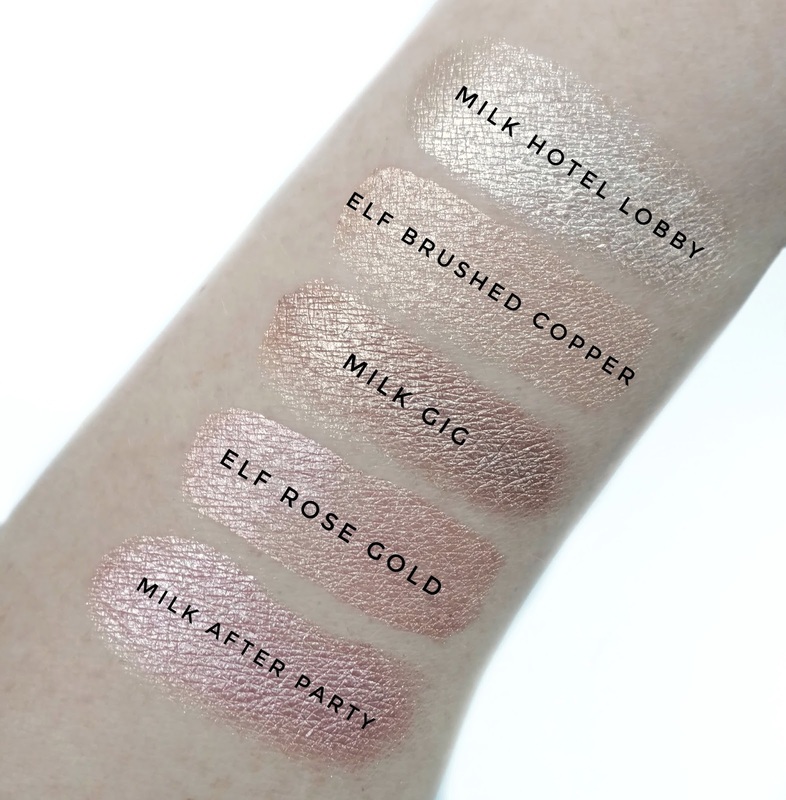 is similar to Milk's After Party, but just a little less pink- but on the eyes, there isn't much of a difference between them at all. The e.l.f. Molten Liquid eyeshadows have an applicator which is a big plus because they're a little less messy. The formula is a bit on the thinner side so I find that I need to build them up a little with two coats to get them to look opaque. They're pretty long-lasting and don't crease on my drier eyelids but by the end of the night, I do find that they have faded away. 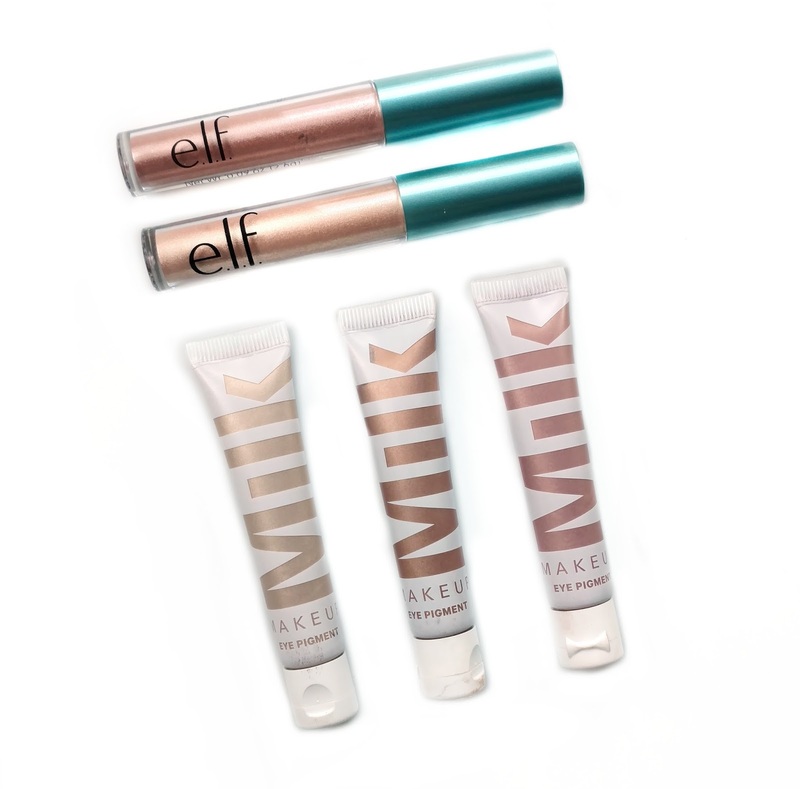 The Milk Makeup Eye Pigments are very opaque and you only need a pin-drop to cover your entire eyelid. Once they dry, they don't crease or move until you take them off with a makeup remover. On the downside, they just squeeze out from the tube with no applicator so they can be a little bit messy. Overall, I would say that the e.l.f Molten Liquid eyeshadows create a very similar effect on your eyes, so if you don't have oily eyelids and you don't need them to last until bedtime, they're a great (and much cheaper) alternative to the Milk Makeup Eye Pigments. However, if you have trouble with cream eyeshadows creasing on you or sliding off your lids (or you're looking for something completely bulletproof) the Milk Eye Pigments are the way to go. 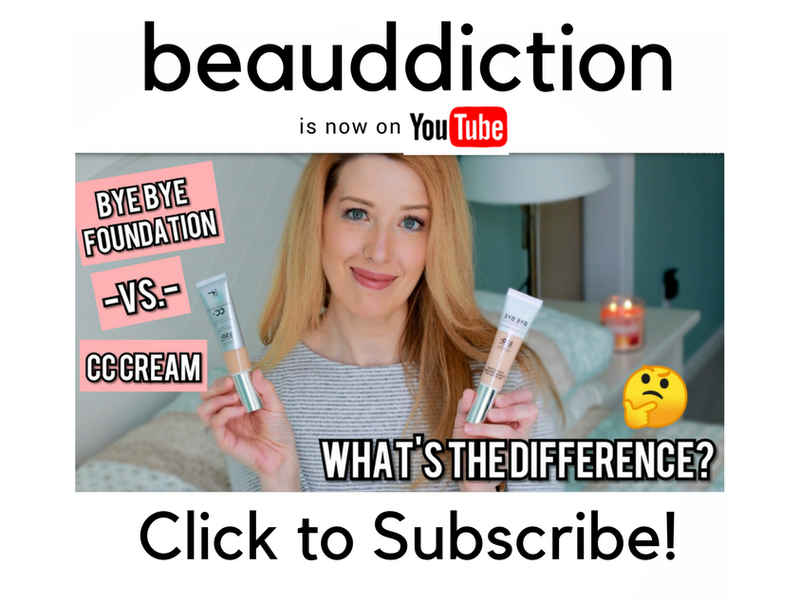 One tube will last forever so they're definitely worth every penny. e.l.f. Aqua Beauty Molten Liquid Eyeshadows are $4 and are available at Ulta Beauty and Target. Have you tried the liquid e.l.f. matte eye shadows? I keep meaning to order them from Ulta because they're online only. They're called "Beautifully Bare Smooth Matte Eyeshadow." I wonder how they compare to other matte cream/liquid shadows like the ones from Bare Minerals. Thanks! these seem like a great product for cheap! definitely gonna pick one or two up!